No matter how you currently do your property inspection reports, you know how important it is to get everything into some kind of format so you can send it off to your clients, maintenance staff, and property owners. The advantage of using a digital property inspection software like Inspect & Cloud is that not only are you able to easily compile all of that information into a beautifully designed PDF report, but you can also simply and quickly email a link the the report from any mobile device or desktop computer. As a matter of fact, one of the “simplest” and yet most profound features of Inspect & Cloud is its ability to easily send property inspection reports quickly to anyone who needs to receive them. Maintenance staff need to repair something? In 1-click you can send the report. Property owner asking questions about the latest status. 1-click send. Sending a property inspection is easy! Sending an inspection report using our digital property inspection software is easy. Once you’ve collected all of the photos, videos, comments, and data you need via the mobile app at the property, you submit everything to the web. Once uploaded to the web, Inspect & Cloud creates a beautifully designed PDF report. This report can now be sent as a host weblink and downloadable PDF document to anyone with an email address. You simply click on the yellow envelope icon, anywhere in the app and voila! Your report is sent! All email, by default, use the standard Inspect & Cloud language to showcase the link. But we want you to be able to use this property inspection software as though you built it specifically for your property management business. That’s why we allow you to customize ALL emails sent out from the mobile app and cloud-based system. This level of customization gives your property management company a certain perceived value to your customers. The thorough property inspection reports give you a competitive advantage. Every time you email out a report, you’re showcasing your value as a property manager. Put a sample report in your prospecting kit and you’ll even find they help you close new business! All emails sent via the Inspect & Cloud property inspection software can be addressed by default to the property owner, or sent to any one or multiple parties by simply typing in additional email addresses. When a property owner and custom click on the link in your email, they will be taken to a beautiful and professional inspection report with your company’s branding and logo. 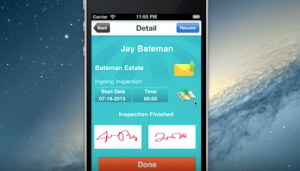 See how to email property inspection reports in action. Watch video.